March | 2013 | Sweet Cats! As you know, there’s no place I’d rather be than College Station. While it is one of the best college towns in the south, (this is in Southern Living, not just my biased/correct opinion) it isn’t exactly the “Retail Capital of Texas”. 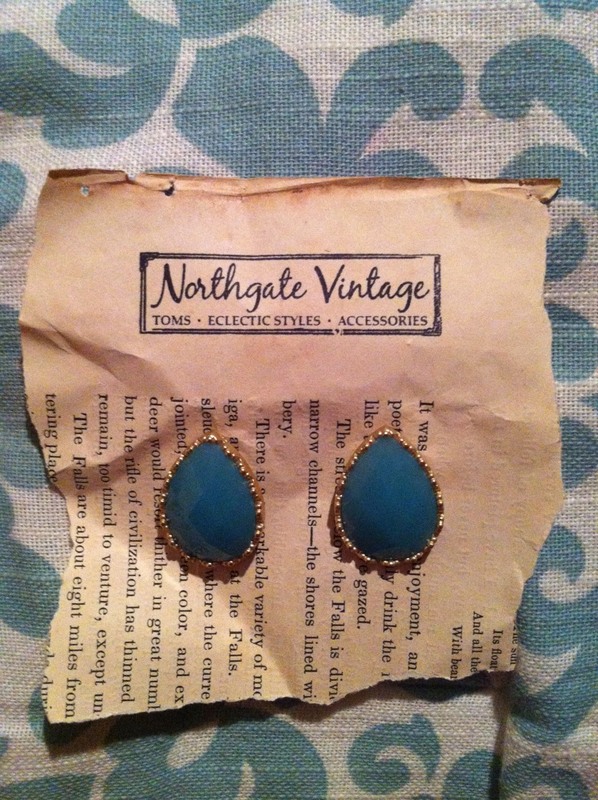 There are some great little boutiques around town, but my personal favorite is Northgate Vintage. Right across from campus in College Station’s “bar district”, Northgate, this precious shop is tucked away between a pizza parlor and a Starbucks. In fact, if you were just strolling the sidewalks, you might walk right past it without even noticing. But don’t do that! Go up the (slightly terrifying) spiral staircase to a wonderful, uniquely-decorated, space and you will find yourself in absolute vintage heaven. It’s a small store, but it is filled with beautiful pieces that your closet is begging to be filled with. Begging. In the fall, they have perfect maroon pieces for gameday in the SEC (an increasingly formal event), in the winter they have a great selection of vintage sweaters, and now they have wonderful bright-colored, lighter pieces for spring! They also have a men’s section, but I don’t shop for men, so if you do, you should go check it out and get back to me. My favorite thing about Northgate Vintage, however, is their jewelry. Jewelry has become a recent obsession of mine. It can add variety and interest to your wardrobe, and dresses up otherwise basic outfits. The jewelry at Northgate Vintage is always in step with the current trends, but still unique. There is something for everyone, from classic stud earrings to over-the-top statement necklaces. And it’s super affordable, most of the earrings are $6-$7, and the necklaces are $11-$15. So that means you can buy a lot and not feel bad about overspending! I have purchased a few baubles from Northgate Vintage this year, and they have made countless appearances in my wardrobe ever since! The beginnings of an extensive collection. 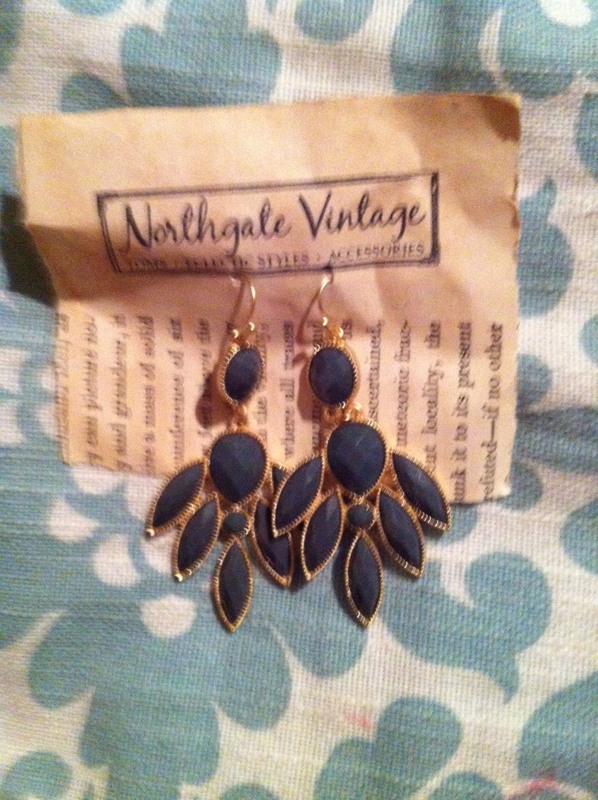 These gold earrings were my first purchase from Northgate Vintage, marking the commencement of my obsession. I bought them in the fall when gold and chevron was all the rage. They are a little bold, which is not what I would originally gravitate towards, but I have loved them! I’ve paired them with a sheer maroon and white top for gameday, a blazer and boots for dinner, and a simple tank and skirt for going out! 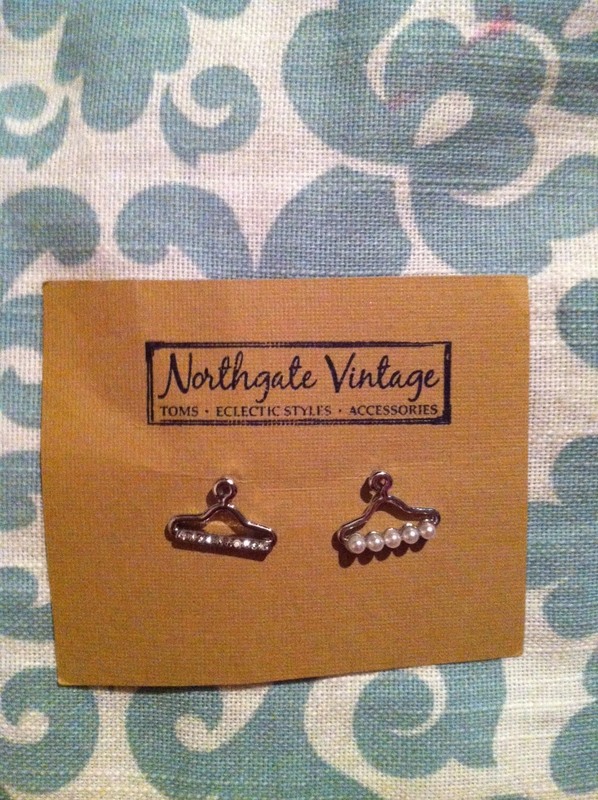 Next we have these adorable little clothes hanger earrings. I saw these and knew that I had to have them! I also bought my sister a matching pair for Christmas, and she loves them too! The fact that they’re clothes hangers conveys my passion for fashion, and I love the touch of whimsy from the mismatched pearls and rhinestones. I wear these with anything and everything! I’ll throw them on with a t-shirt and leggings for class, or if I’m wearing a shirt or dress with a busy pattern. They have also become my go-to earrings for silver jewelry days. These grey chandelier earrings are also something I wouldn’t normally buy, but they have proved to be new favorites as well! Grey is a new favorite neutral of mine, so I love how these go with lots of different outfits. As of right now I’ve only worn them once, with a cotton dress with a small light pink and cornflower blue floral print, a blue jean jacket, and boots. I tried them on, not expecting them to match, but they did! I also plan to wear them with a cute cream, lace peplum top I just purchased! Now for one of my absolute favorites. These teal teardrop oversized studs complete my life. Well, they nearly complete my wardrobe. I’m loving teal for spring and summer, and I’m thinking it will transition into fall as well! The teardrop shape makes them different from your average studs. I wear these with many different things, such as a blazer and boots, a solid black longsleeve tee and mustard jeans, and even dresses! They’re beautiful and interesting, yet still simple enough to wear with busy outfits. Don’t you just love it when you find something that’s been at the top of your wishlist forever? 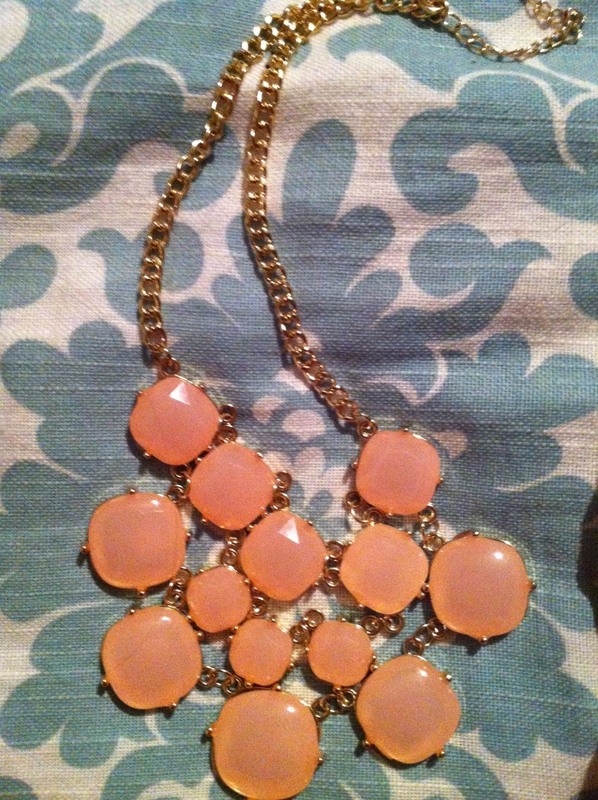 That’s what happened when I found this light pink statement necklace. Statement necklaces have been growing exponentially in popularity, and it was seriously stressing me out that I hadn’t jumped on the trendy train yet. I like this because it’s not too extreme but it’s still an attention-getter. I also really like the color, it’s more versatile than I expected! I typically wear this with solid tees and a cardigan, both of which I hoard, so I have plenty of options. I’m also looking forward to trying this with my new peplum top I mentioned earlier! I absolutely adore all of my baubles from Northgate Vintage, and I look forward to returning soon for another shopping spree! In addition to their merchandise, I admire this business because they give back to the College Station and global community. 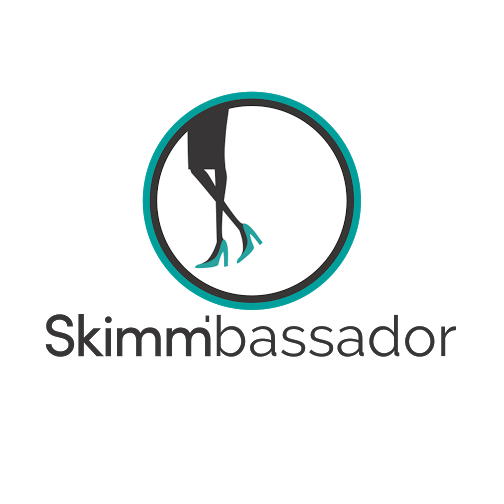 They have hosted numerous profit shares for organizations and sororities benefiting their philanthropies, and they carry products whose profits benefit people around the world, such as TOMS, bracelets and headbands made by women in third-world countries, and makeup that fights human trafficking. So, the next time you’re down in Aggieland, stop by Northgate Vintage for a unique College Station shopping experience! Or check them out online or on Facebook!